In developed countries, there has never before been such a great variety of seafood on offer. Globalization serves up the delicacies of shoreline, reef and open sea from the farthest reaches of the planet to anybody willing to pay. Supermarket counters groan under a cornucopia of shellfish and finfish that please the eye and ravish the palate. But buyers with a conscience must choose carefully, because for many species on offer, the price paid by the environment for their capture is far greater than the ticket price. Is the species in trouble in the wild where the animals were caught? Does fishing for the species damage ocean habitats? Is there a large amount of unwanted bycatch taken with the target species? Does the fishery have a problem with discards – generally undersized animals caught and thrown away because their market value is low? Avoid large, long-lived species that mature late in life, as these species are easily overfished. Examples include skates, sharks, swordfish, marlin, some tunas, halibut and sturgeon (caviar). Avoid all deep-sea species because they are very easily overfished. They tend to be long-lived, slow growing and mature late in life. 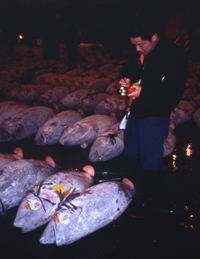 However, added to these problems, deep-sea fishing causes immense habitat damage and has severe bycatch problems. None of the bycatch survives because of extreme pressure and temperature changes on bringing them to the surface. Examples include orange roughy, Patagonian toothfish (aka Chilean seabass), oreo dories, scabbardfish (espado), grenadiers (hoki), black halibut, redfish, and deep-water prawns. Many fishing methods have terrible impacts on habitats and other marine life. Bottom trawls, scallop dredges and hydraulic clam dredges tear up or bury fragile marine life growing on the bottom like corals, seafans and sponges. Gill nets hang like ghostly walls in the water and drown thousands of marine mammals and seabirds, as well as catching many worthless species that are thrown away. Prawn and shrimp fisheries have the worst record for bycatch, with five to ten kilograms of bycatch thrown away for every kilo of shrimps landed. Think about how much of a pile those dead and discarded animals would make on your plate the next time you tuck into a meal of shrimps or prawns! Choose animals caught with minimal damage to the environment. ‘Hand-picked’, ‘diver-caught’, ‘hook and line-caught’, ‘pole and line’, ‘creel’ or ‘trap-caught’ species are usually good bets. Avoid trawls, dredges, gill nets, long-lines and drift nets. ‘Dolphin-friendly’ tuna brands are not always what they seem. Much of the tuna caught in the Eastern Pacific still involves surrounding dolphins with purse-seine nets. Even though few dolphins are killed outright, animals are stressed and mothers get separated from their young. Pole and line caught tuna is the best choice. Aquaculture is not the solution it might seem to overfishing. Many farm-raised fish like salmon, bass and groupers are fed with fishmeal from wild-caught fish. It takes several kilos of wild fish to grow a kilo of farmed fish. Some fish farms are stocked with fry or young caught from the wild. Aquaculture also has direct impacts on the environment including pollution from chemicals, excess feed and wastes produced, alien species introductions, and habitat destruction to make way for ponds or cages. For example, shrimp farming has caused vast areas of mangrove forest to be cleared along tropical coasts. Some aquaculture is better than others, however. Choose fish that feed low in the food chain, such as tilapia, catfish and carp. Avoid predators like salmon, groupers and tuna. Choose shellfish such as mussels and oysters. Farming shellfish can do favours for coastal water quality, as these animals filter plankton and other organic matter from the water. While organic farms cause less contamination of the environment from use of chemicals, the animals still produce polluting faeces and are often still fed on wild-caught fish.